This empty-nest couple, Bernadette and Chuck Gerbe, wanted to start a new life in the city. They’d purchased a 150-year-old building that had previously housed a men’s clothier, a butcher and a beauty shop. They had a vision of creating a live-work glass studio in the Lawrenceville section of Pittsburgh. Knowing what they wanted, the owners sketched a floor plan on a napkin and then solicited the help of architect Andrew Moss to complete the drawings. The goal was to renovate the owner’s glass art studio and connect it to their living space. Adding 40 feet onto the old building offered many challenges – particularly, renovating a tight city space – but the outcome proved to be worth all the work. 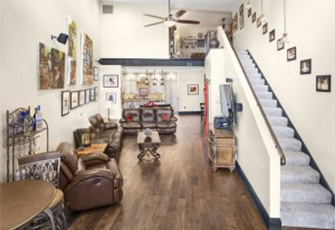 The finished project resulted in a renovated building to accommodate the live work glass studio and shop front, and added 2,600 square feet of functional living space that includes two upstairs bedrooms, a bath and a half, and a 20-foot-high wall in the living room that showcases family artwork. The residential addition also provides Bernadette with space to display her work throughout the home. Some of her glass pieces include iridescent tiles in the upstairs bathroom, cabinet knobs in the kitchen and a vessel bowl in the powder room on the first floor – which happens to be the first she’s ever made. The residential addition includes a beautiful courtyard at the rear of the house that has an outdoor gas fireplace, along with a light fixture created by Chuck which expresses the owners’ personalities and unique style. The property also features a newly-constructed garage completed by Prime 1 Builders earlier this year. NOTE: The Gerbe Glass Studio project was named a bronze winner in the Whole House Renovation ($300-$750K) category in the 2014 Professional Remodeler Magazine Design Awards. Construction Timelines: What to know before you build!